TORRANCE, Calif., Nov. 14, 2012 – Toyota Motor Sales, U.S.A., Inc. (TMS), will conduct two safety recalls involving Prius vehicles as part of the recall announced today by Toyota Motor Corporation. 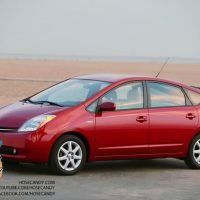 Approximately 670,000 Prius vehicles are being recalled in the United States to inspect and in some cases replace the steering intermediate extension shaft. Toyota dealers will inspect the extension shaft to determine if it needs to be replaced and, if confirmed, will replace it. The inspection and repair will take approximately one hour depending on the dealer’s work schedule. Approximately 350,000 of these same Prius vehicles are also being recalled to replace the electric water pump for the hybrid system. Toyota dealers will replace the electric water pump for the hybrid system. The repair will take approximately two hours depending on the dealer’s work schedule. There have been no crashes or injuries reported for these two conditions. Owners of vehicles covered by these safety recalls will receive an owner notification letter via first class mail starting in December 2012. Any authorized Toyota dealer will perform these recalls at no charge to the vehicle owner.